Welcome to the Stocking Stuffers for Kids Giveaway! Sponsored by: Zuru, Famosa and the Ohio Art Company Hosted by: Powered by Mom Blog and her fabulous blogger friends! I know I know we don’t want to necessarily think about Christmas yet but it’s coming quicker than we think and to make things just a bit easier for you here are some wonderful ideas for stocking stuffers for boys and girls! They’re fun, some are cute, some are interesting and they’re all fairly inexpensive and are a great stocking stuffer choice! 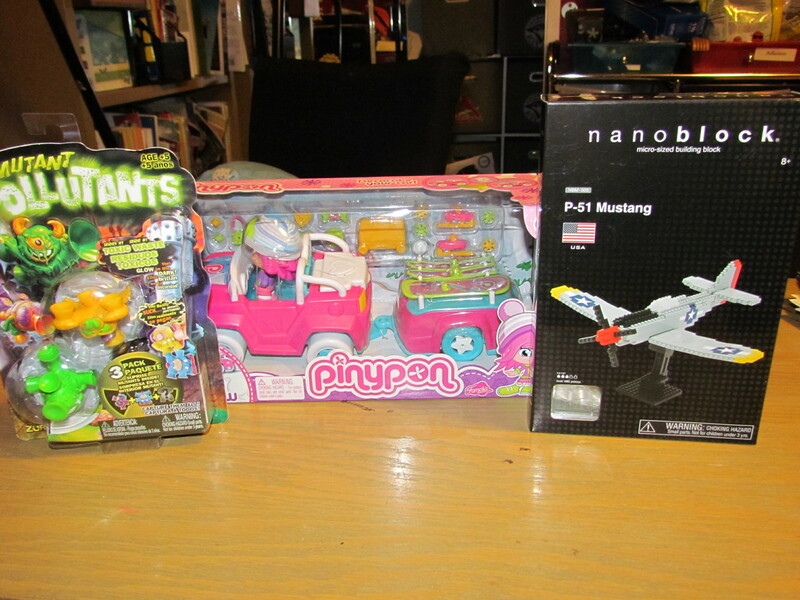 We received a package of all three of these wonderful toys that we think would make excellent stocking stuffers the Mutant Pollutants, Nanoblock Mustang and the Pinypon Snow Adventure Car & Tow set. My daughter thought the Mutant Pollutants were pretty cool and as we recycle a lot at home she’s been using them as an example to our younger family members as to why pollution and waste is so bad. I thought how wonderful of her and not only are the Mutant Pollutants different and cool they do help give kids and adults a way to demonstrate that we need to take care of our planet. Mutant Pollutants are the interesting. some are cute, some look scary, some look goofy and well they have an array of looks, colors and characters. Their toxic levels are off the charts! They were created in the icky Sucker Factory sewers with toxic slime and they radiate a poisonous glow-in-the-dark light! Next up is NanoBlocks and they have some fun building blocks this year where you can make some very cool stuff. Kids love putting things together and taking them apart and the Nanoblocks not only fit the bill they’ll exceed it. Kids creativity and logical thinking skills will be utilized while they’re having fun with NanoBlocks! Last but not least it’s the Pinypon Snow Adventure Car & Tow it will appeal to little girls everywhere. It’s a cute miniature line and the Snow Collection is new for 2013. The set comes with a unique Pinypon friend and pet in winter attire along with snowboard, skis, luggage and more! How fun! My daughter thinks they are so cute and she thinks we should give a set to my 9 year old niece for Christmas so that’s on the list now for her. Overall we give all these toys a big two thumbs up for being reasonably priced, cool and fun and they make the list for top items for stocking stuffers this holiday season! One lucky winner will receive a three pack of Mutant Pollutants, the Nanoblock Mustang and the Pinypon Snow Adventure Car & Tow set! Enter on the rafflecopter below! The participating bloggers were not compensated for this post. We are not associated with any of the companies named above. No purchase is necessary to enter. Void where prohibited by law. The odds of winning are based on the number of entries received Open to the Continental US 18+ only. Confirmed Winner(s) (by Random.org) will be contacted by email. Winner(s) have 24 hours to respond before a new winner is chosen. No purchase necessary. Void where prohibited by law. The sponsor(s) will be responsible for product shipment to winner(s) of this giveaway. My blog is not responsible for product shipment/delivery. This event is in no way administered, sponsored, or endorsed by, or associated with, Facebook and/or Twitter, Google, Pinterest. This disclosure is done in accordance with the Federal Trade Commission 10 CFR, Part 255 Guides Concerning the Use of Endorsements. Entrants must only enter with either one email address, IP address and/or Facebook account, anyone found violating these rules will be disqualified. It is at the sole discretion of the admin of the giveaway if the winner has met the rules or not. I like to put little toys and christmas candy in my kids stockings as it is my mom’s tradition. 3 of my kids get candy and small toys. My oldest daughter gets candy, makeup and accessories. We get candy and small toys. Candy, coloring books, crayons, socks, anything small enough to fit in stocking. I always put a new toothbrush in there, and little toys. I usually get candy and small toys. I get Barbies, make-up, Hot Wheels, things like this. We grew up with apples and oranges so that is what we give along with a little candy and toys. But don’t forget the toothbrushes and toothpaste and other needed items. Being I have boys stockings to stuff, usually cars & small stuff & of course candy! Paper and pens, creativity thinking items, toys like cars, and candy. I like to get markers, crayons, coloring books, hot wheels and other small toys and gifts. We like to get our son all different kinds of things. We usually do a little bit of candy, a few hot wheels, and an action figure or two. Things that don’t require batteries. The small lego kids are fun. Nail polish too. I love to put small games in my kids’ stockings. Card games, hand-held electronic games, dice games. My daughter likes to see hairbrushes and lip gloss, so I get her girly things. But my 3 sons prefer Hot Wheels and Legos. I love putting together stockings! I always over do them. Every year I always put new tooth brushes, a special ornament, candy, gift cards and small toys. they usually get little toys in them! For stocking stuffers I will get mostly Christmas candy but will also include a small item or two. It could be a Matchbox car, kids make-up, new markers, holiday socks. etc.. I like to get small toys, a piece of candy, etc. A little bit of everything: lip gloss, socks, a special toy, candy, hair accessories, etc. We usually put oranges or apples in each sock, as well as small toys – yoyos, small cars, lifesavers. For the older kids we put small puzzles, key chains, and maybe a dollar wrapped up over and over. I like to get small items like army men. I like to get fun, little toys that are preferably educational, and definitely will last more than one use. it depends on the age. I always put in candy and usually chapstick. Then I do small toys or puzzles. Nail polish for the older girls. GI Joes and such for the boys. Depends on what they are interested that year that will fit and is small. We put candy and little toys like matchbox cars, G.I.Joe’s, etc for our boys and the girls get candy and make-up, jewelry, etc. inexpensive ones bc they end up in the to box the next day! I like to get the mini-Lego figures for my son, plus candy and new art supplies. These items sounds great too. I like to give christmas candy and practical things like socks underwear and toothbrushes! Things they need with fun stuff too! I like to put crayons, matchbox cars, playdough, candy, etc! Its small toys and candy for my little one. Small toy, Collectable cards, lip balm, and markers. I like to buy little toys and candy for stocking stuffers! I like small toys and candy. I like to give lip gloss, toy cars, and books. Lego’s or bath tub toys are my go to stocking stuffers. My husband always puts candy in the stocking as well. Legos for the boys and girly stuff for girls jewelry or makeup. Then there is always gift cards. I put in little stuff. And I make sure they get their candy cane full of hershey kisses. Love to get candy ! I like to get unusual and unique little toys; such as wind-up toys and miniature animals. I have a son so I always put cars and little people. Santa puts in small toys, nuts and fruit. I like to get books, puzzles, games, stuffed animals…and of course, candy and gum. An orange in the toe, toothbrush and then little toys and candy. We normally put candy and fruit in their stockings. I usually get them small things like cookies, crackers, and small toys. My sons often get activity books with crayons, puzzles, and chocolate. I usually get sily small things from Targets dollar aisle. They tend to have candy, socks, coloring things, all kinds of neat things usually. This is the first year with my daughter so I’m not sure what I’ll end up getting her, but 2 of these would be great for my nephew! I usually stuff their stockings with traditional candies, socks, pjs rolled up and art supplies. I get my children things they need for stocking stuffers, like toothbrush & paste, socks, mitts, etc. as well as small things I know they will enjoy like lip chap, nail polish, small toys, and of course a chocolate and/or candy. Usually I buy candy and DVDs. I like hair ties, candy, small toys, legos, etc. Hair accessories, little tin puzzles, and m&m’s. for my daughter. For my son, matchbox cars, m&m’s, and sock. Our kids have huge socks and Santa fills them with a big variety of items. He puts in small toys, books, candy and always a stuffed animal. Thanks for the great giveaway opportunity. Keep up the terrific blogging. I like to put in my kids stockings things like new pencils and markers, chapstick/lipgloss, little $ tree toys, and small costume jewelry. Candy, silly bands, cars, toothbrush, jewelry…….little things. Jerky, puzzles, small lego sets, books, stickers, small travel games, gum or mints, pencils and erasers. I got my nine year old a few coloring books and some cute dolls (she is really into Monster High lately) and for my infant daughter I got teething rings and mini blocks she also got a piglet little blanket buddy. Candy, hot wheels cars, etc. small toys, candy, travel sized toiletries in holiday packaging, hot chocolate mixes. gift cards to fav. places, accessories, toothbrushes, a new ornament, and fruit. I usually put small toys, crafts, stickers, make-up and lipbalms, and toiletries in stockings along with their candy and fruit. I like to get smaller items such as small toys like lego set, jewelry, funky shoe laces, hair accessories, action figures, cars and gift cards. I like to get small stuffed animals or candy for my kid’s stockings. I usually get candy, crayons, color books, small puzzles. I always got things like gum, candy, small toys, puzzles, fruit. I feel like simple things in the stockings are best, because they lead up to the bigger gifts. Small things that will fit in a stocking..maybe something out of the ordinary. I like the stocking to be exciting too! I like to get them little things like christmas candy, hair ties, chapstick, toothbrushes, that kind of stuff!